This dish was incredibly easy to make and according to my husband, “best stuffed peppers I’ve ever made.” It can easily be made into a vegan meal by omitting the goat cheese. The meal was also inexpensive to make for a family a four. It cost approximately $15, including salad greens. This does not include the oil and pumpkin spice, which I already had on hand. I never see sweet potatoes on superfood lists, but they truly are a super food. They are package with antioxidants, beta-carotene, vitamins C and E. These nutrients combined give sweet potatoes healing power. They can help with memory, maintaining a healthy heart, and studies have proven that they have cancer-fighting properties as well. Sweet potatoes are high in complex carbohydrates, the good carbs, which will help with controlling your weight by controlling your blood sugar levels. They are also high in fiber, which is great for overall health, but definitely for controlling your weight because fiber provides bulk that will keep you feeling full for longer periods of time, preventing you from overeating and craving an unhealthy snack between meals. Melt coconut oil in a large sauté pan over medium-high heat. Add the sweet potatoes, pumpkin spice, pinch of sea salt and black pepper to taste. Turn down heat to medium-low cook, covered, for about 20 minutes, stirring frequently. Continue to cook until potatoes are soft. While potatoes are cooking, prepare the peppers. Cut the peppers in half lengthwise, removing the sees and white flesh. Place them, cut side up, on a large baking sheet line with parchment paper. Place them in the oven for 20 minutes, until the peppers are soft. Remove peppers from the oven. 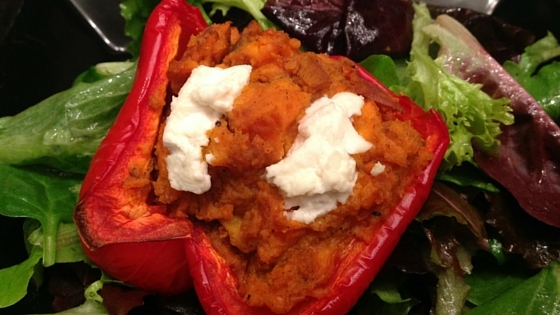 Spoon the sweet potato mixture into each pepper and add two dollops of goat cheese on top. Return to the oven for another 10 minutes to soften the goat cheese. Remove from the oven and let sit for 5 minutes before serving. Serve with salad greens and enjoy! ← How Do You Want To Feel?